If you follow me on Instagram, you may have noticed I got a lot of family time in over the weekend. I also got to see a friend who lives out of town and hasn't been home in awhile, and who I helped plan a baby shower for many moons ago. 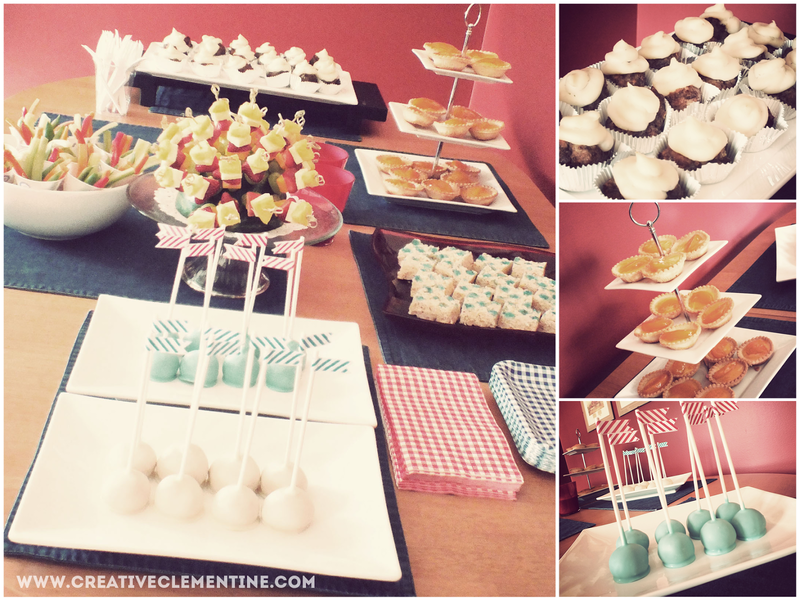 A baby shower I still haven't blogged about! Bad blogger, bad. 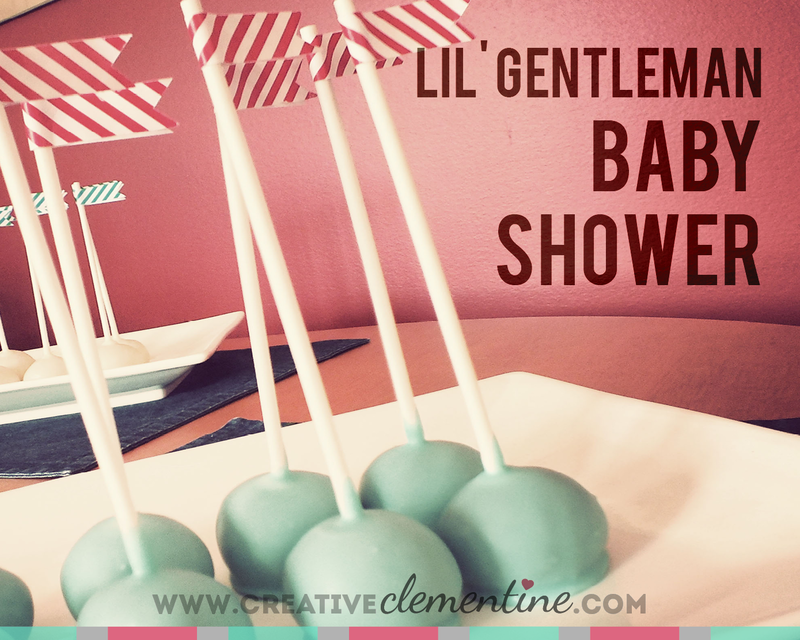 Since I'm in the habit of sharing parties that are in no way recent, I thought it was worth swooping in and sharing something old but sweet: A Lil' Gentleman "Meet & Greet" baby shower. If you ever get the chance to attend a baby shower I am hosting, you'll notice I tend to avoid party games at all costs. In lieu of the pain and misery of baby shower games (if I have to smell/touch/acknowledge one more diaper filled with peanut butter I am going to kick someone), I shoot for an interactive guest book. Something personal and not nauseating, while still being cute. 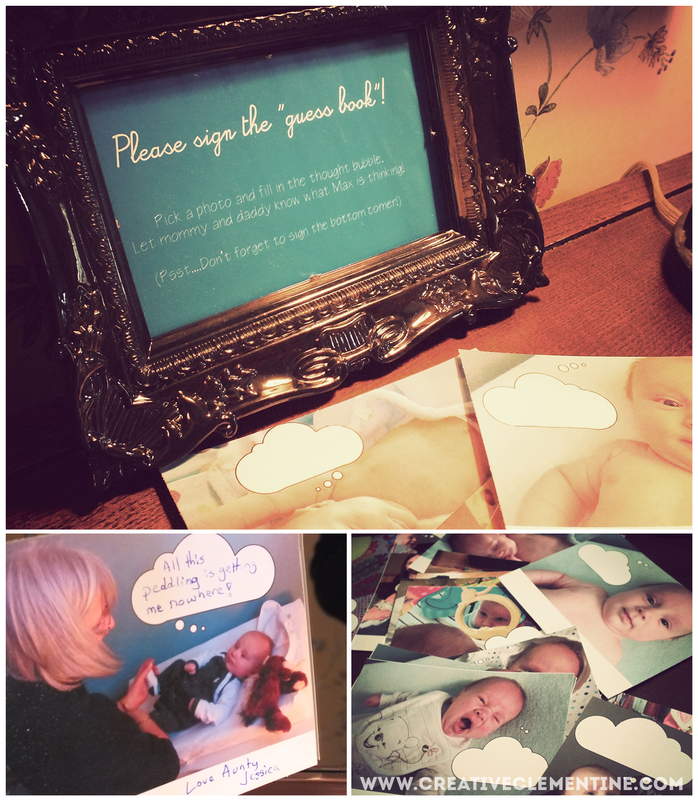 For this shower, we used photos of the lil' gentleman himself and had guests fill in thought bubbles. It helped that the little dude has an amazingly expressive face! The guest of honour was already a few months old, as the parents live out of town. A happy Auntie arranged the shower as a way for family and friends to meet the little man on a quick weekend visit. In the end, we went with a simple theme and simple designs. The main focus was, of course, the little man! We decorated with items that went with the flow of the (gorgeous) house-- a simple fabric bunting banner at the entrance, with vintage toys displayed around the house. Guests took home a bag of homemade candy corn (nicknamed "crack") which the family is famous for. The food was tasty but practical: some sweet, some savoury, and fruits and vegetables to keep it healthy. 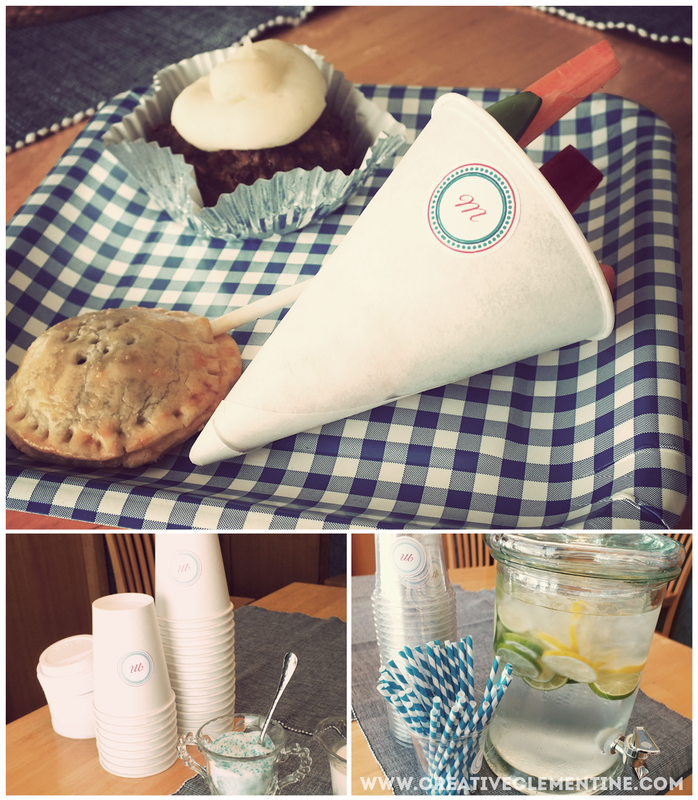 The main events were meatloaf cupcakes served with decadent mashed potato "icing", and savoury mushroom pie on a stick. The Lil' Man's monogram was plastered all over everything---including a onesie which I almost broke all of my "don't put people's faces on the internet without asking" rules for to show you. Babies in custom onesies pull all of my heartstrings. My blog needs more of those. Overall, it was a laid back day with vintage charm, good eats, and a super cute baby being passed around. That's the good stuff. I love these ideas! My friend is pregnant with her second baby and she'd love a shower like this! Thanks so much for linking up at Talented Tuesday!